Click here to download a PDF of this manual in printer friendly format. Please follow these assembly instructions carefully. If you skip a step or try to build the Pip-Boy in the wrong order you may not be able to assemble it correctly. IMPORTANT By far the best and quickest way to build your Pip-Boy 2000 Mk VI is to approach the job methodically. Before you start each step, study the image for that step then find and neatly lay out the parts that you are going to need to complete the step. When tightening nuts and screws, do not over tighten. Remember that you are screwing into plastic resin, so over-tightening the nuts and screws may damage the housing. The assembly process has been developed to require no special model-making skills; however, care and attention to detail will be needed if the Pip-Boy is going to be assembled properly. Although there are many parts and the assembly looks complex, it is actually easier than it looks, although some step will test your dexterity. If you follow the directions carefully you should have no problem building your own Pip-Boy 2000. No paint or glue is required. This kit replicates a brand-new demonstration model of the Vault-Tec Pip-Boy built and supplied by RobCo. IMPORTANT Take care with the small components: they are easy to drop or lose before they are assembled into position. Assemble the Pip-Boy and its subassemblies in a clear area with good lighting on a flat surface. Unpack the small components box and any small parts bags carefully onto a large flat clean and clear working surface to avoid losing any of the small components. It is very important that you do not allow infants or children to handle the components or the assembled Pip-Boy as there is a risk of choking and the finished product might be easily damaged. This Pip-Boy kit is designed as a replica to mimic the look and feel of a real Pip-Boy 2000 Mk VI, but due to the kit construction, it is not intended to be as robust as the standard piece of RobCo hardware and so will not withstand high loads or being mistreated. Handle your Pip-Boy with care and do not subject it to drops or knocks. 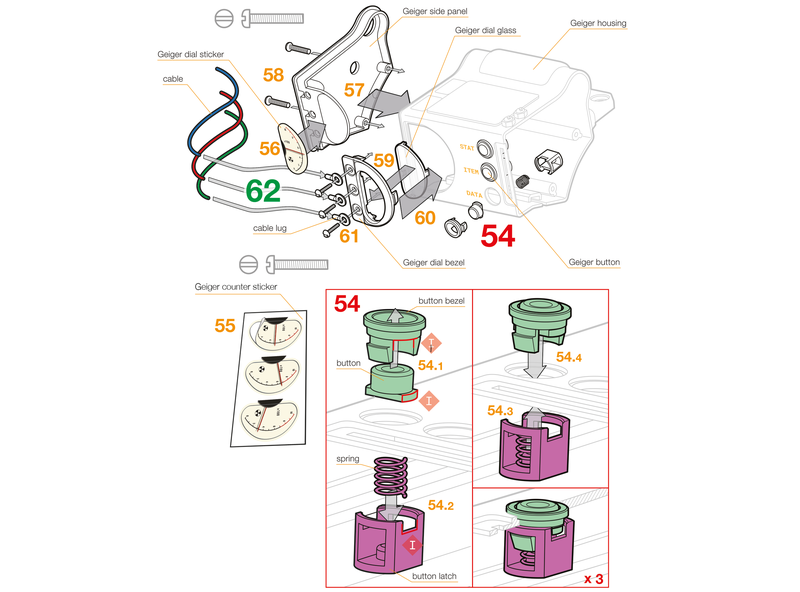 The use and function of the various buttons and dials are described below, after the assembly instructions. The management of RobCo and its representatives will not accept responsibility for damage incurred to the Pip-Boy due to misuse, or failure to adhere to these instructions in full. Do not submerge in water. Do not expose to strong sunlight for extended periods. Protect from high levels of radiation. This Pip-Boy is not a toy and not intended for assembly or use by any persons under the age of 14. Use by underage persons is contrary to Vault-Tec’s recommendation and Vault-Tec and its representatives will not be held responsible if accident or injury occurs where this operating condition has been disregarded. Place the left holotape body in the left holotape frame. Place the right holotape body in the right holotape frame. Assemble the left and right sides of the holotape and push together. Screw in 6 mm thread-forming screw. Snap tape guard into position. 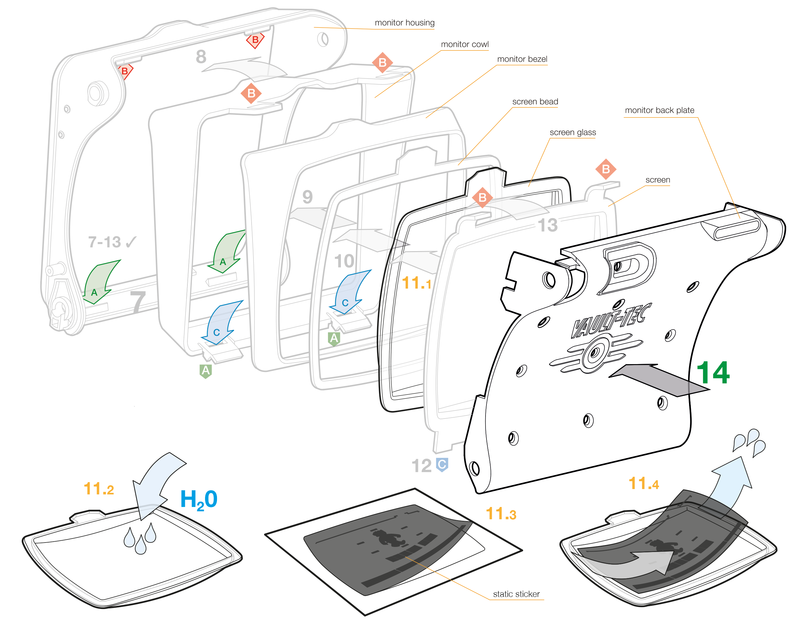 Note: Once you have assembled the holotape, decide whether you would like to use the long or short holotape sticker, write out the sticker with your chosen title and apply it in the recess on the spine of the holotape body. Please note that the monitor screen comes pre-assembled. 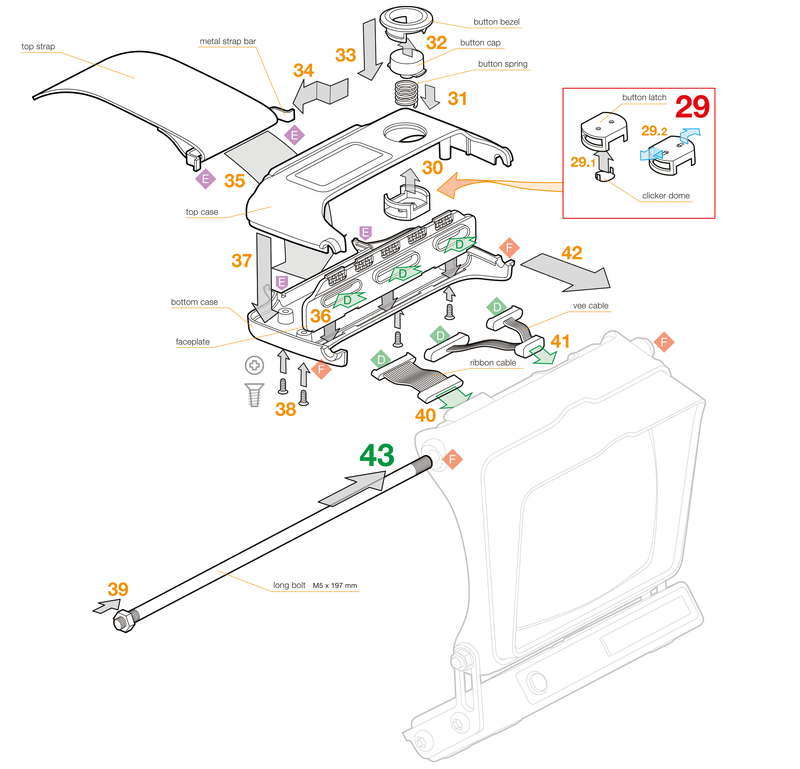 However, the assembly process is described for completeness in case you wish to disassemble the monitor screen. In any event, should you wish to fit the static sticker screen image, you will need to remove the screen and screen glass so that you can place the sticker on the inside of the screen. This should be done before assembling the rest of the Pip-Boy. Clip the monitor cowl inside monitor housing by first engaging the monitor cowl’s lower clips (A) in front of the monitor housing’s location ridges in the lower part of the housing. Tilt the top of the monitor cowl forward until spring clips (B) catch under monitor housing top catches. Note: it is not recommended that you disassemble these two parts, as the clips are quite strong and you may damage the monitor cowl when doing so. The monitor bezel is cone shaped. Holding parts face down, place the bezel inside the monitor cowl so that bigger end of the cone shape is facing into the monitor cowl, and the top centre feature lines up with the feature recess in the monitor cowl. Place the screen bead inside the monitor bezel so that top tab engages in the bezel top recess feature. Place the screen glass on top of the screen bead so that the tab lines up with the bead top tab. Insert the screen’s bottom tabs (C) into the slots at base of monitor cowl. Tilt the screen forward so that both top tabs (B) catch under the monitor housing’s top catches (B). Slide the back plate into the rear of the monitor assembly so that the top and bottom holes at each side of the back plate line up with the M5 bolt holes in the sides of the housing. 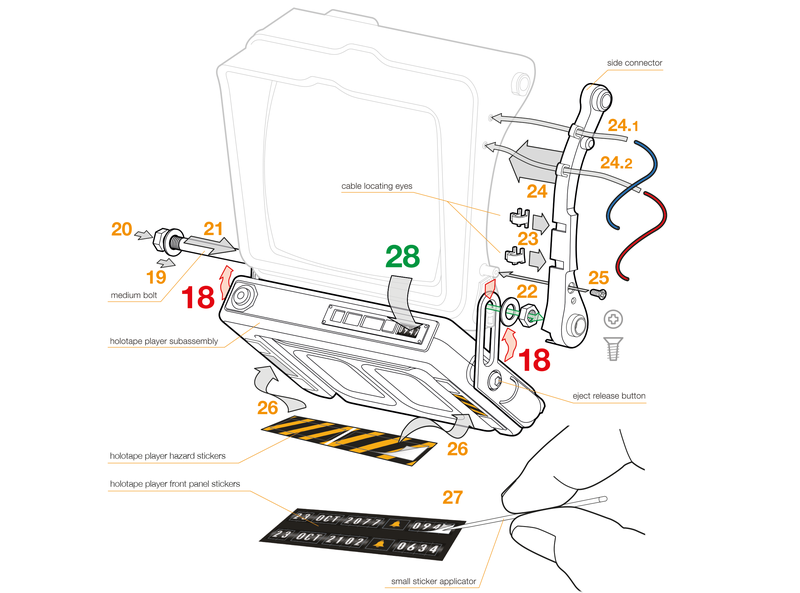 Note: If you wish to add the static label to your Pip-Boy screen, then you will need to partially disassemble the screen assembly. To do this, slide out the back plate, pop the screen clips (C) out from their latched position and lift out the screen. Lift out the screen glass and rest on a supporting surface (11.2). In order to avoid scratching the front of the screen, lay the screen on a soft cloth or hand-towel. In a dust-free environment, peel off the static label (11.3) and carefully lay it on the inside of the screen glass (11.4). Rub down the label to remove as many of the air bubbles as possible and reassemble the screen assembly starting from step 11 above. Fit the shorter of the two cuff braces onto the keyed rib at the back of the radio housing. Fit the cuff brace cover that has more of a curved back edge to cuff brace so that the two parts trap the radio housing keyed rib between them. 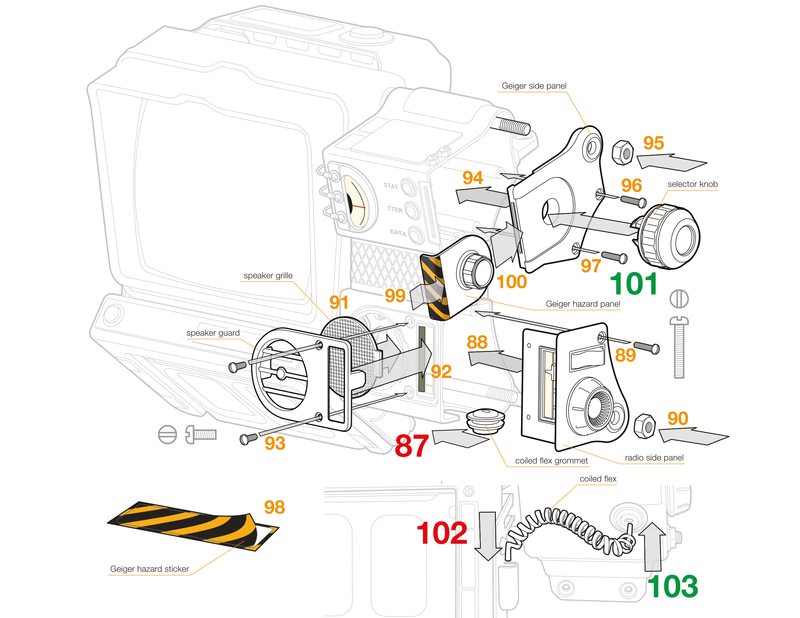 Please note that the holotape player comes pre-assembled because it contains small, interlocking mechanism parts and springs that are tricky to assemble. To retain function, please do not disassemble. Carefully position the chassis bar over the alignment tabs of the bottom two holes either side of the Monitor Housing so that the holotape control panel is facing to the front. Slide the medium-sized (130 mm long) threaded bolt through the chassis bar slots and through the monitor housing and lower backplate holes. Slide the M5 washer onto the left-hand end of the bolt. Fit the M5 nut to the end of the threaded bolt, screwing it onto the bolt until about 2 mm of the bolt is protruding from the nut, then push the bolt all the way through the monitor assembly. Slide the other M5 washer onto the right-hand end of the threaded bolt and fit and tighten the M5 nut to the right-hand end of the threaded bolt. Tighten the nut with the 8 mm spanner provided. Insert the two cable locating eyes into the matching slots in the side connector. Note that the eyes are different sizes, so take care when matching the eye to the corresponding slot. Push the side connector into place on the side of the monitor housing assembly. Note that to make it easier for a future build step, you might like to insert the upper two of the three Geiger counter cables (blue and red) as you slide the side connector into place. The cables poke into the small holes in the side of the screen monitor housing, each one travelling through the locating eye nearest to it. The eyes do not line up with the holes, so some routing of the cables will be necessary. Screw the 6 mm thread-forming screw through the side connector into the monitor housing to secure the monitor housing in place. Place the two rectangular hazard labels on the base of the holotape player at each side between the raised rectangular areas. Choose which date and time you wish your holotape player to display and, using the (toothpick) small sticker applicator, carefully lift out each small sticker in turn. Using the small sticker applicator, position and rub down each date and time sticker into its appropriate recess. Place the clicker dome inside the button latch so that the tabs poke through the small holes in the base of the button latch so that the clicker dome is convex side up (29.1). Holding the dome in place with your finger, turn the button latch over and bend the clicker dome tabs underneath button latch to lock it in place (29.2). Offer up the button latch to the inside of the top case so that it lines up with the large buttonhole. Place the button spring through the hole and into the button latch. Fit the button cap inside the button bezel making sure that the two tabs at the sides of the button line up with the button bezel tab recesses. Push the button bezel and button cap through the hole so that the button bezel snap fits into the button latch, locking it into place in the top case hole. Slide the metal strap bar into the loop at the end of the top strap so that the strap is centered on the bar. Fit the strap and bar to the bottom case, into the two slots at the rear of the bottom case. Fit the faceplate into the bottom case so that the small tabs locate into their matching slots in front of the base. Fit the top case to the bottom case. Screw the top and bottom case together using four 6 mm thread-forming screws. Screw an M5 nut to the end of the long threaded bolt so that 2 – 3 mm of bolt is poking out from the nut. Push the non-stepped end of the ribbon cable into the left-hand recess (looking from the back) of the monitor screen backplate. Push the pointed end of the vee cable into the right-hand recess (looking from the back) of the monitor screen backplate. Slide the completed control module into position at the top of the monitor screen assembly so that the holes in the sides of the control module line up with the holes in the sides of the monitor screen assembly. As you slide the two parts together fit the free ends of the ribbon and vee cables into their respective slots in the front of the faceplate (D). Slide the long threaded bolt through the holes in the sides of the monitor housing, control module and backplate to lock these three subassemblies together. Place the vacuum bulbs onto the vacuum bulb tray. Slide the vacuum bulb tray and bulbs into the vacuum housing. Slide the vacuum back panel into the vacuum housing behind the vacuum bulbs, at the back of the housing. Slide the vacuum grille onto the front of the subassembly so that it wraps round the vacuum housing and the small tabs at (G) and (H) line up with their respective positions on the vacuum housing. Slide the long cuff brace up the back of the Geiger housing and under the keyed rib. Slide the cuff brace cover down onto the keyed rib, so that the two parts trap the Geiger housing keyed rib between them. Screw the two M2 nuts onto the two short M2 slot-head screws and fit the screws into the two holes on top of the Geiger housing. Remove the backing from the self-adhesive rectangle on the back of the specification plate. Carefully position the specification plate in the matching recess in the top of the Geiger housing and press it firmly to secure. Build the three miniature buttons in the same way that you built the control module button (steps 30 to 33). Take care with the buttons, springs and other small components as they can be easily dropped or lost. It is recommended that you build these small button assemblies on a large clear surface. Select which Geiger dial reading you would like your Pip-Boy model to display – high, medium or low radiation levels, and peel off the relevant Geiger dial sticker. Stick the sticker to the Geiger side panel so that its curved edge lines up with the curved edge of the Geiger side panel dial backboard. Slide the Geiger side panel into the Geiger housing subassembly. Fix the Geiger side panel in position by screwing in the two slot-head screws. Place the Geiger dial glass into the Geiger dial bezel. Snap the Geiger bezel into position in the Geiger housing. Secure the cable lugs to the front of the Geiger dial bezel with the three slot-head screws so that the lugs point to the left. Slot the cables into the cable lugs. Note that the cables will be a loose fit, which is fine since, in the final model, there is no tension on the cables. However, these cables may be fixed later with adhesive or by crimping the cable lugs as preferred. Using the small sticker applicator (toothpick), carefully peel off the radio scale sticker and stick it into position in the radio dial recess in the front of the radio side cover. Note to take care to stick it accurately in position so that it doesn’t impede the smooth motion of the radio dial pointer. The sticker should have its left-hand edge tight against the left-hand side of the recess and no part of the sticker should be hanging over the right-hand edge of the recess. From the inside, slip the radio pointer through the radio dial slot so that the pointer is to the front of the slot and overlapping the radio scale sticker image. Fit the radio dial glass into the front recess so that the longitudinal bar is pointing back into the radio mechanism and under the pointer, thus preventing the pointer from falling out, while allowing the pointer to move freely up and down the dial. Move the pointer back and forth to check that it is able to move completely freely. If you notice that it encounters any friction, carefully check the cause and remedy it before moving on to the next step. If the scale sticker is causing the issue due to it not being aligned correctly, remove the glass and the pointer and reposition the sticker correctly. Snap-fit the radio rocker switch into position. Push-fit the radio tuning knob end stop fully into the end of the tuning knob. Snap-fit the radio tuning knob into the radio side panel. Push one of the radio tuning axles partly into one of the axle holes. Slip one of the radio tuning pulleys onto the tuning axle. Push-fit the tuning axle end cap onto the tuning axle and push the axle fully down into the axle hole. Push the remaining radio tuning axle partly into the other axle hole. Slip the remaining radio tuning pulley onto the second tuning axle. Push-fit the remaining tuning axle end cap onto the second tuning axle and push the axle fully down into the axle hole. Tuck the radio tuning cable under the radio pointer cable-gripping bars. Track the cable around each pulley wheel and once around the tuning knob shaft. Note that actually, the cable is passing approximately one and half times around the tuning knob shaft. Once you have fitted the tuning cable, check the operation of the tuning knob to make sure that it is functioning correctly. When the knob is turned, the pointer should move freely up and down the dial. If the pointer does not move freely, investigate why and remedy the issue (see step 65) before moving on to the next construction step. Slide the Geiger housing onto the long threaded bolt. 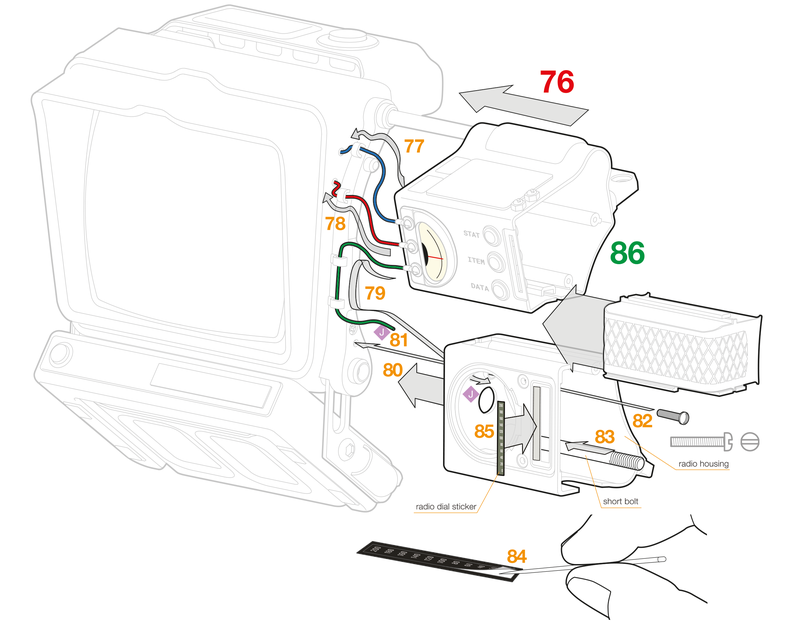 If you have already fitted the blue cable to the display monitor side connector in step 24.1, then thread the free end of the cable through the top cable lug. Otherwise, thread the blue cable through the top cable locating eye on the side connector, bend it tightly round and poke it into the upper hole in the side of the monitor housing. If you have already fitted the red cable to the monitor housing in step 24.2, then thread the free end of the cable through the middle cable lug. Otherwise, thread the red cable through the middle cable locating eye on the side connector, bend it tightly round and poke it into the lower hole in the side of the monitor housing. Thread the green cable through the bottom two cable locating eyes on the side connector. Fit the radio housing to the side connector. While fitting the radio housing ensure that the green cable is poked through the hole on the side of the radio housing. Fix the radio housing to the side connector with the M2 slot-head screw. Fit the short threaded bolt into the hole inside the radio housing. Using the small sticker applicator (toothpick), carefully peel off the radio dial sticker. Using the small sticker applicator, carefully position the radio dial sticker on the front of the radio recess to the left of the dial window slot. Slide the vacuum housing subassembly all the way in between the Geiger and radio housings, ensuring that the top grille tabs line up with the matching tab recess on the Geiger housing. Slide coiled flex grommet into the matching slot in the underside of the radio housing. Note that the recess on the grommet should be facing down and visible when the unit is fully assembled. Slide the radio tuning side panel subassembly into the radio housing. Guide the short M5 threaded bolt through the matching hole in the side panel. Ensure that the vacuum grille tab is located in its matching tab recess and push the radio tuning side panel fully home. Fit the slot head screw in the side panel and tighten. Fit the M5 nut to the protruding end of the threaded bolt and gently tighten with the 8 mm spanner. Fit the speaker grille into the front of the radio housing in the matching recess. Fit the radio speaker guard over the speaker grille, located on the two matching slots and push home. Note that the right-hand tab engages with a matching slot stack in the front of the radio housing and the front of the tuning mechanism side panel, so you might have to push the side panel towards the radio housing slightly to ensure that the slots line up. Fit the two M2 slot-head screws into the front of the speaker guard and tighten. Slide the Geiger side panel into position to close the Geiger housing. Guide the long threaded bolt through the matching hole in the side panel. Ensure that the vacuum tube housing grille top tab is located in its matching tab recess as you fully push home the side panel. Fit the M5 nut to the protruding threaded bolt and gently tighten with the 8 mm spanner. Do not over tighten the nut as this will compress the screen and the screen may become loose or push back when pressed if the long bolt is too tight. Fit and tighten the upper slot-head screw. Fit and tighten the lower slot-head screw. Peel the Geiger hazard sticker off the sticker sheet. Carefully attach the Geiger hazard sticker to the front of the Geiger hazard panel so that it aligns with the left-hand edge and wraps slightly round to the side on the right-hand side. Slide the Geiger hazard panel into to its matching recess in the Geiger main side panel. Note that the Geiger hazard panel has a small locking tab that holds it in position and locks through matching slots in the Geiger housing and Geiger side panel. Ensure these slots are aligned before pushing it fully into position. Push in and snap fit the Geiger housing knob into the matching hole in the Geiger hazard panel. This action locks the hazard panel in place. Insert the short end of the coiled flex cable into the flex junction cover on the right-hand side of the holotape player frame. Inside there is a matching slot for the flex; ensure that the flex is pushed into the slot. Ensure that the flex is pushed all the way down into the junction cover so that the first part of the coil overlaps the junction cover opening edge. This is so that the coiled flex does not get in the way of the button on the holotape chassis bar that is in front of the junction cover, as you will need to be able to press this button later on to operate the tape ejection mechanism. Insert the long end of the coiled cable into the coiled cable grommet on the underside of the radio housing Straighten the last coil of the cable and push it all the way through the hole in the grommet to ensure that the cable is fixed in the hole and does not drop out. The fit is intentionally loose to make it easy to assemble; a small amount of an appropriate adhesive may be used to permanently fix the coiled cable in place if required. Push the three large cuff clips through their respective buttonholes in the large cuff from the inside to the outside. Look at the clips carefully: you will note that one of the three clip prongs is longer than the other two; this prong should be at the top. Offer the cuff up to the Pip-Boy assembly behind the monitor backplate so that the clip prongs line up with the matching holes in the backplate. Important note: The cuff clips can be broken if inserted in the wrong way up. Please check orientation carefully before inserting. Push the left-hand clip (looking from the back) into place working from the top, pressing home each clip one at a time till you hear it snap into place. Push the middle clip into place working from the top, pressing home each clip one at a time till you hear it snap into place. Push the right-hand clip (looking from the back) into place working from the top, pressing home each clip one at a time till you hear it snap into place. Note 1. Getting the cuff to fit a range of arm sizes is tricky. You may need a little bit of trial and error to get the cuff to comfortably fit your arm. If you have thinner arms it might be helpful to wear your Pip-Boy over clothing. Adjustment of this Pip-Boy is made by adjusting the Velcro join between the large and small cuffs. The large cuff diameter can be enlarged and fixed using the Velcro join to the small cuff. Similarly, the large cuff diameter can be reduced even to the point where the large cuff overlaps itself and again, this diameter can be more or less fixed by the Velcro join to the small cuff. 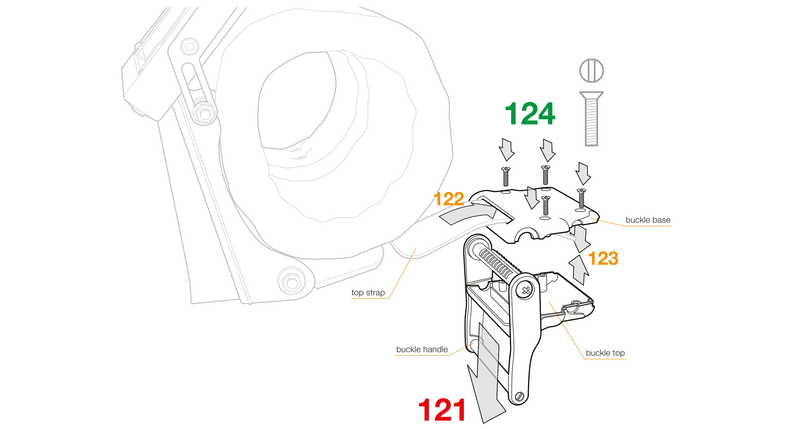 Some degree of tightening and fine-tuning the fitting can be achieved by the buckle adjustment which is explained in steps 121 to 124, below. Note 2. Because this stage involves partially fitting the Pip-Boy to check and tune the fit, it might be useful to enlist the help of a friend to assist you with these construction steps. Slip the Pip-Boy onto your arm and establish how tight you think the cuff should be for a comfortable and stable fit. Ensuring that the small cuff button holes line up with the matching holes in the upper and lower small cuff braces, slip your hand through the small cuff and offer it up to the large cuff. Insert the upper cuff brace cross-head bolts into the small cuff button holes and poke them through the cuff brace holes and screw in the cuff brace screws. Insert the lower cuff brace cross-head bolts into the small cuff button holes and poke them through the cuff brace holes and screw in the cuff brace screws. 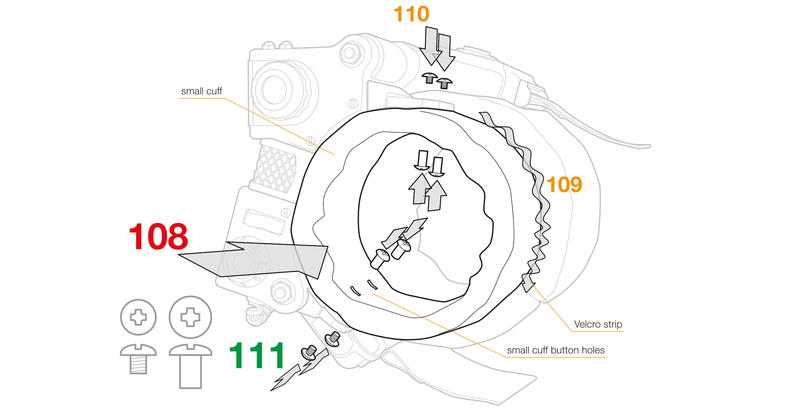 Insert the spring into the larger of the two recesses in the button release lever. Fit the release lever through the buckle catch so that the spring end rests in the matching slot (K), and the button pokes through the other side. Pinch the lever between thumb and forefinger so that the hole in the lever lines up with the hole in the button catch and press the latch pin into the hole and through the lever to lock it into place. Check the function of the catch by pressing the button and seeing if the latch moves in and out and when not pressed, springs back to the out position. Note. Repeat these steps to build the second buckle catch. Slide the strap locking pin into the silken loop at the end of the lower strap (the strap attached to the holotape player chassis bar). Slide the silken fabric loop into the slot in the lower strap grip so that the locking pin is inside the strap grip and prevents the strap from pulling out of the grip bar. Fit one of the assembled buckle catches to the lower strap grip bar. Fix the buckle catch to the bar using one of the hex-head bolts using the Allen key provided. Fit the remaining assembled buckle catch to the lower strap grip bar. Fix the remaining buckle catch to the bar using the remaining hex-head bolt using the Allen key provided. Note. The buckle can be used to further fine-tune the tightness of the cuff. If your arm is thin, then you might want to shorten the upper strap by trimming it. As this may take some trial and error, and as you will not be able to make the strap longer once you have trimmed it, it would be a good idea to fit the strap as it is first so that you can assess whether it needs shortening later. If you do need to trim the length of the strap by physically cutting it, do so carefully with a sharp pair of scissors so the cut is straight and seal the edge of the strap with a hot knife edge or adhesive to stop it fraying. Lower the handle into the upturned buckle upper housing so that it rests in the matching semi-circular bushes. Insert the strap into the buckle base housing so that the end of the strap lies neatly in the buckle base housing. The strap may be effectively shortened a little bit by folding the end over when you lay the strap in the buckle. Fit the upper and lower housing together so as to grip the buckle handle in position. Fit the four slot-head screws into the base of the buckle housing to fix the buckle housing together. Push the buckle catch into the matching recess in the buckle. Push the buckle handle down towards the cuff to lock the strap in position. Note: if the buckle is not tight enough, lift the handle and push some more of the strap into the buckle. If the strap is already as far into the buckle as it will go, remove the screws holding the buckle together, separate the top and bottom buckle housings and shorten the strap as explained in the previous section, then reassemble the buckle. CONGRATULATIONS! You have completed the Pip-Boy build. It’s likely you have done it in record time too… well, at least you’ve probably set a new world record for you building Pip-Boys – RobCo would be proud of you and Vault-Tec salutes your efforts; it’s clear you will have the necessary skills to rebuild. Display your Pip-Boy or wear it with pride. © 2018 The Wand Company Limited. © 2018 Bethesda Softworks LLC, a ZeniMax Media company. FALLOUT, BETHESDA and related logos are trademarks or registered trademarks of ZeniMax Media Inc. or its affiliates in the U.S. and other countries. Star Trek logo TM © 2018 CBS Studios Inc., licensed by CBS Consumer Products. All Rights Reserved.